For the transperitoneal approach, the patient is placed in the 45° modified flank position. The surgeon and the assistant stand facing the abdomen of the patient. FIGURE 1 ■ During retroperitoneal laparoscopic partial nephrectomy the patient is positioned in the 90° flank position. (A) Anterior view showing the arms placed on a double arm board in a neutral position. An axillary roll is placed and the patient is taped to the operating table. (B) Posterior view showing the operative table flexed and the kidney rest elevated to maximize the space between the iliac crest and the subcostal margin. Foam pads are placed under the hip, knees, and ankles. The head is supported to keep a neutral neck position. Similar patient positioning is needed during transperitoneal laparoscopic partial nephrectomy with some variation including tilting the patient to a 45° position and minimizing table flexion. FIGURE2 ■ (A) Intraoperative laparoscopic ultrasound is performed using a flexible ultrasound probe with a steerable tip. (B) Intraoperative illustration of excision margin planning using ultrasound guidance. Abbreviations: K, kidney; T, tumor. During right partial nephrectomy, an additional 5 mm port is inserted at the subxiphiod location for cephalad retraction of the liver. The port used to insert the Satinsky clamp is placed in the lower abdomen such that the Satinsky is applied parallel to the aorta and vena cava. direct vision, a 12 mm port is placed at the lateral edge of the ipsilateral rectus muscle along the level of the 12th rib, and a 5 mm port at the angle of the costal margin with the lateral edge of the ipsilateral rectus muscle. The laparoscope is then shifted to the middle port. During right partial nephrectomy, an additional 5 mm port is inserted at the subxiphiod location for cephalad retraction of the liver (Fig. 3). The colon is mobilized medially to expose the renal hilum. On the right side, gentle mobilization of the duodenum may be needed and the liver is retracted cephalad above the renal upper pole. The ureter is identified and dissected off the psoas muscle toward the renal hilum to avoid inadvertent clamping of the ureter along with the renal hilum. The renal artery and vein are not dissected individually and the renal hilum is clamped en bloc using a Satinsky clamp. The port used to insert the Satinsky clamp is placed in the lower abdomen such that the Satinsky is applied parallel to the aorta and vena cava. Thick tissue surrounding the renal vessels should be dissected to avoid incomplete Satinsky occlusion (Fig. 4). Gerota's fascia is incised and kidney is mobilized generously from within the Gerota, enough to expose the tumor and surrounding normal renal parenchyma. Fatty tissue covering the tumor is maintained en bloc with the tumor. After adequate hydration and intravenous administration of Mannitol (12.5 g), a Satinsky clamp is introduced through a separate port placed in the ipsilateral lower quadrant, and the renal hilum is clamped en bloc (Fig. 4). Care is taken to ensure that any accessory renal arteries or veins are included within the jaws of the clamp. If necessary, additional individual bulldog clamps can be employed. After renal hilar control, the tumor is excised including a margin of normal renal parenchyma. Cold endoshears is used to cut the renal parenchyma along the previously scored renal capsule (Fig. 5). FIGURE 4 ■ Transperitoneal laparoscopic partial nephrectomy. Laparoscopic Satinsky clamp is used to control the renal hilum en bloc. Individual dissection of the renal artery and vein is not necessary. Intraoperative illustration of en bloc renal hilum clamping. FIGURE3 ■ Illustration of port positioning during laparoscopic left partial nephrectomy. The Satinsky port is placed in the lower abdominal quadrant such that the Satinsky is almost parallel to the aorta and vena cava. An additional 2 mm miniport (arrow) is placed in the lateral flank position for additional traction. During right partial nephrectomy, an additional subxiphiod port (X) is inserted for cephalad retraction of the liver. 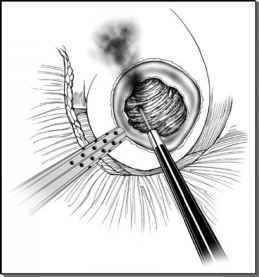 A Jackson-Pratt drain is placed if pelvi-calyceal repair was performed. Ports are removed under vision after securing hemostasis. placed using GS-25 needle and 0 Vicryl suture over a prepared surgicel bolsters (Fig. 7). The biologic hemostatic agent, Floseal, is layered directly onto the partial nephrectomy bed, deep to the surgical bolster. After securing hemostasis, renal hilum is unclamped and warm ischemia time is noted. Hemostasis is rechecked after desuf-flating the abdomen to zero intraperitoneal pressure for 10 to 15 minutes. Occasionally, bleeding temporarily tamponated by pneumoperitoneal pressure can be unveiled and controlled (Fig. 8). The excised renal tumor is entrapped within an Endocatch baga and extracted intact from the lower port site. A Jackson-Pratt drain is placed if pelvicalyceal repair was performed. Ports are removed under vision after securing hemostasis.